Saw this on the FishingWire and wanted to share. I love these rods. I use the tournament legend rods. They're awesome. Park Falls, WI - In an industry where fishing rod models seem to come and go, the story of St. Croix’s Premier series (casting and spinning) is an exceptional tale of creativity, rebirth, and longevity. In fact, 2019 marks a celebratory 60 years that the rod has been in anglers’ hands—the longest continuous availability of any one rod series in the marketplace and fishing history itself. Yet, a closer look at the 60 years reveals a story of vastly greater significance. Sure, Premier has sold millions of units and is an iconic rod that anglers literally love to fish, but it’s also an emblem of St. Croix culture and telling of the company’s ups and downs over those many decades. Just as the rod has gone through many transformations, so did the company—from a manufacturer of premium fishing rods in the ‘50s and ‘60s to a company that nearly closed in the 1970s prior to the purchase by Gordon Schluter in January of 1978 and reinvention of the Premier rod series in the early-to-mid-1980s by brothers Paul, Jeff, and Dave Schluter and their family of passionate employees. 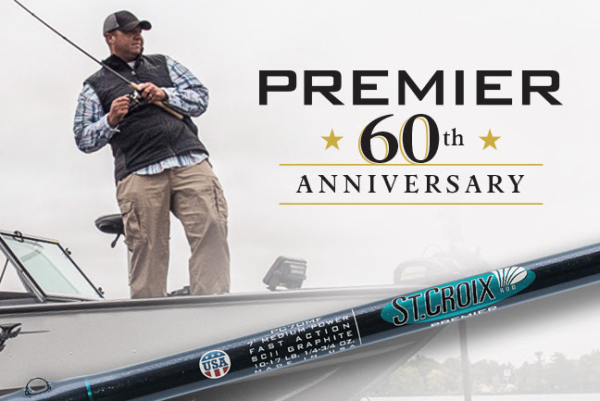 Launched in 1959 with seven spinning and three casting models, the first St. Croix Premier rods were fiberglass similar to other premium fishing rods of the era. Throughout the 1960s, Premier fiberglass rods were top-of-the-line and incredibly popular and didn’t begin to lose momentum until graphite blanks began to set the new standard in performance and quality in the 1970s to early 1980s. Premier spinning rod featured in 1959 St. Croix Rod catalog. Sensing this shift in the marketplace based on extensive conversations with customers and retailers, brothers Paul and Jeff Schluter made the decision to move the Premier line to carbon/graphite blanks and contemporize componentry, as well as the overall look, feel, and performance. Thus, the first graphite Premier rods appeared in the 1984-1985 St. Croix Rod catalog and an entirely new era began for the company. “The Premier rod of the 1970s were high-quality rods; they were well constructed but were heavier and less sensitive than the few good graphite rods on the market at the time. Paul went on the road and quickly realized we weren’t even competitive, so he came back in-house and his job was to reconfigure Premier more or less so we could take it out into the market and fight for market share. We weren’t even competitive at the time, we just weren’t. Was it a good rod? Sure, it was a decent rod, but it was ten years plus behind the times so we had a lot of catching up to do,” says Jeff Schluter, V.P. – Brand Management. “Glass rods were simply not competitive. They were outdated and we had lost much of our distribution because Premier hadn’t kept up with advances in rod technology. Most people don’t realize that the company was actually in the process of closing the business during this time. The announcement was made public that the factory in Park Falls, Wisconsin was going to close in October of 1977 and then Gordon bought the company in January of 1978 and kept it open,” says Paul Schluter, President. These lean and difficult years into account, in many ways, the modern history of St. Croix Rod as the brand is known today all starts with the launch of the carbon-based Premier rod series in 1984-1985. Since, the rod has grown into the most popular U.S-built rod series through its various iterations and remains so in 2019, a full 60 years since its inception. “The Premier series has retained its tremendous popularity over the decades in great part because it provides incredible performance and value while maintaining its U.S.-built heritage,” says Jeff Schluter. But it was 20 years ago that Jeff Schluter came up with a cosmetic change that is reflected in today’s iconic Premier, an immediately-recognizable turquoise motif found on each of the 69 currently-available Premier models for anglers of all freshwater species—from panfish and trout to bass, walleye, pike, musky, and more. Prior to the change to turquoise St. Croix badge and trim, Premier rods featured a gold leaf label and maroon with gold metallic trim. Over the past two decades these rods have simply become iconic and immediately recognizable on the water. But there’s much more to them than the streamlined look. Feel is what has driven countless anglers to make the rods their mainstays. “When you talk to anglers who have been part of the St. Croix family for years, they always talk about the fact that they started with a Premier,” says Jesse Simpkins, Director of Marketing. That being said, let’s all lift our glasses to 60 years of Premier and the blood, sweat, and tears the rod series represents, a history of an American fishing brand once near the point of extinction but reinvented by something as simple—and complex—as one fishing rod series. A toast should also be made to all those anglers, dealers, and extended St. Croix fans who’ve helped make it what it is over the decades—and continue to do so today and beyond. Yes, here’s to 60 years of an iconic U.S.-built fishing rod series, brand, and greater factory of employees who continue to persevere and manufacture products that will provide every angler the best fishing experience possible.